While walking around Oxford I saw a Topshop, grabbed my boyfriend's hand and pulled him straight for it! I have seen some of their polishes on blogs and I really wanted to get a few while I was visiting England. 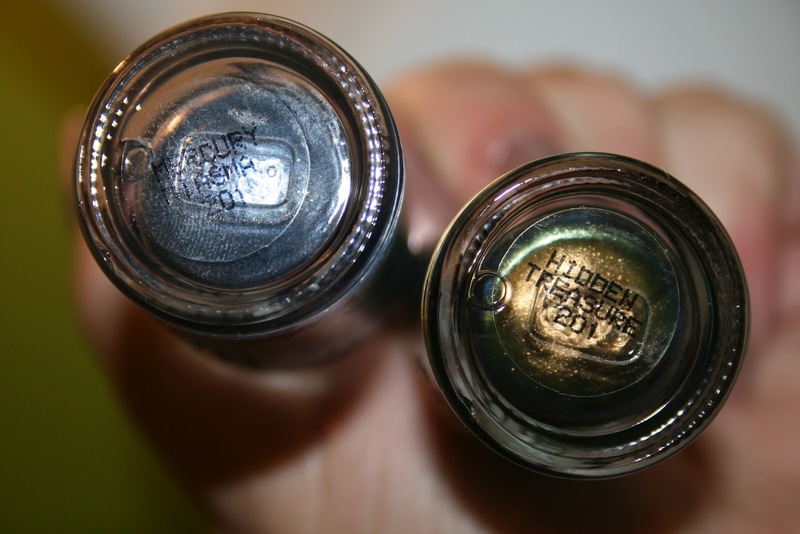 Once inside, I found the polishes and there was not a huge selection, but I was instantly in love with Hidden Treasure. I told my boyfriend to pick out another shade for me. I should add that he is amazing, a good sport who will amuse himself for as long as it takes me in any beauty store. He chose Mercury Miasma. I love them both! I wore Mercury Miasma to the wedding we went to the next day and regret not photographing it! Next time... this one is much nicer on my nails than it is is the bottle. And, it wore really well. No chips, just gradual tip wear. And, do you want to know a secret? On most days, I am wearing crazy socks! I don't know why. I just love me some cute, fun socks! And these are super cute & fun! And, they were 3 for £8. Have you tried any topshop polishes? I was hoping to pick up some more on my trip, but we never crossed paths again.